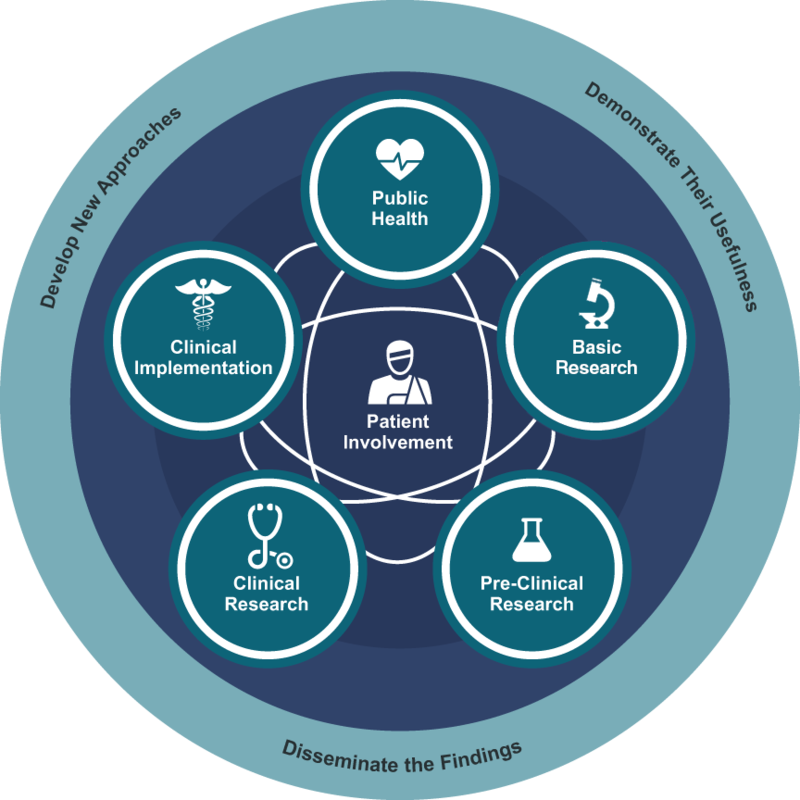 The Institute for Clinical and Translational Science is soliciting applications from all faculty members to facilitate the development of successful, high-functioning, and interdisciplinary teams to apply a wide range of methodological expertise and perspectives to a particular problem within the translational science spectrum (graphic courtesy of NCATS). Teams are strongly encouraged to include a stakeholder engagement component and/or mobile technology. The Mobile Technology Lab and Community Engagement Core are available to assist research teams in developing successful strategies. Proposals involving investigators from multiple colleges will be reviewed favorably, as will proposals that have a clearly defined path for future external funding involving the team, especially those proposals that may lead to the development of program project awards or other similar large multi-investigator awards. We anticipate 30%-40% of teams completing the full proposal will receive awards. PILOTS will provide $15,000 direct costs for each team member up to $75,000. 1. The principal investigator must be a full-time University of Iowa faculty member. To promote the development of effective scientific teams and to increase competencies of UI faculty in team science, teams selected to submit full proposals will be required to attend a workshop developed by the ICTS on the principles of team science and strategies for creating successful teams. Please contact ICTS if your team includes external collaborators that would require long-distance travel in order to attend any of the workshops. These situations will be considered on a case by case basis. Newly created teams are encouraged though teams that have a longer track record of collaboration are eligible if they have added critical new team members for this proposal. Teams must have a minimum of three members. All members of the team will be required to participate, unless otherwise approved by ICTS. The workshop will be open to all teams submitting letters of intent, even if not selected to submit a full proposal. Teams that receive awards will receive consultation in strategies for team success and support from a Team Science Specialist. Awardees will be expected to submit a six-month progress report as well as a Final Progress Report at the end of the funded project. Awardees are expected to publish their findings in scholarly peer-reviewed journals and present their research at professional meetings and to cite the University of Iowa CTSA NIH award (number UL1TR002537) on each publication, press release, or other documents about research supported by this award. Each LOI and full proposal is scored by three independent reviewers. The review committee evaluates LOIs and full proposals according to five equally weighted criteria for innovation, scientific merit, investigative team, the potential for future funding, high-risk/high reward potential. Each of the criteria is scored using NIH scoring criteria, and individual criterion scores are averaged to calculate an overall score. For PILOTS, additional review scores are factored into the overall decision: the degree to which the proposal integrates their plan for engaging in team science, stakeholder engagement, or the use of mobile technology . Funding requests will be provided at $15,000 per investigator with a minimum of three investigators ($45,000). There is no limit to the size of the team but the award is capped at $75,000. Funds for laboratory supplies, small equipment, patient costs, and consultants are allowable. Funds may be requested for study-related personnel salaries. Funds cannot be used to support faculty salary. Travel expenses are not allowable. Awardees must be in compliance with all IRB and IACUC policies. Although final IRB/IACUC approval is not required at the time of submission, applicants are encouraged to begin the submission process early. The National Center for Advancing Translational Science (NCATS) requires the review and approval of all NIH CTSA funded pilot grants involving human subjects. NCATS reviews take approximately 30 days. Funds will not be released without NCATS approval. Projects that involve animal research must have IACUC approval before funds will be released. An award may be rescinded for failure to obtain IRB/IACUC approvals within three months after the notice of award. 1.Submit an initial 1-page letter of intent, along with individual faculty NIH or NSF Biosketches, no later than October 22, 2018, to Nic Johnson, MBA, Program Manager. Specific aims: provide at least one specific aim along with brief rationale (full application will require more in-depth description). Collaborators and synergy: provide a list of contributors along with corresponding departments and the unique collaboration that the team will bring to the project. Stakeholder engagement: describe the stakeholders you will involve in the project (e.g., community members, community organizations, patients or patient advocacy organizations, academic or industry partners, etc.) and how and in what aspect of research they will participate. (E.g., guidance on research design, development of research protocol and instruments, recruitment, feeding back research results). Mobile Technology Lab: Describe the data you would like to collect from subjects outside of traditional healthcare or research settings. What types of data (e.g., short answers, surveys, sensor readings, images, audio or video) will you be collecting? How will you use these data to inform your study? What is the scale of your study? How will these data help you better understand the disease or health-related behavior you are investigating. Expected significance: provide a brief description of how this project will contribute to advancing translational research (more detailed description required in full application). 2. After the letters of intent have been reviewed by the ICTS, select teams will receive an email invitation by October 31, 2018, to submit a full proposal through I-CART. Deadline for submission of full proposals: November 21, 2018.